If you used ICE, MyColor will appear automatically in the Attribute list. But if you used the User Options property, you’ll have to use a script one-liner to set the Attribute value. That’s because Softimage doesn’t know about the user parameters on Arnold nodes: those come into existence only when SItoA translates the scene to Arnold. On a related note, the MtoA shader userDataColor does the same thing as the SItoA Color Attribute shader: it uses AiUDataGetRGBA() to get a color from a user parameter on the object being shaded. 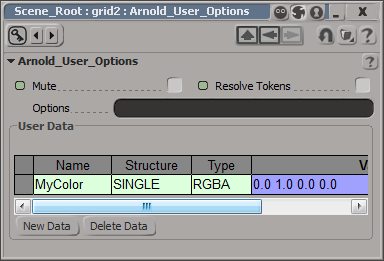 With SItoA 3.0, the Arnold > DLL Shaders menu makes it pretty easy to use an MtoA shader in Softimage. This entry was posted in Arnold, Shaders, sitoa and tagged Arnold, User Parameters by xsisupport. Bookmark the permalink. Im tying to copy Mtoa shaders to Sitoa Bin to get the Mtoa User Data Color working, but no luck so far. Any advice on that?